Aunt Millie's Healthy Goodness Breads - Buy 1, Get 2 FREE! Buy any 4 and receive a $2 Catalina; Buy any 5 and receive a $3 Catalina; Buy any 6 and receive a $4 Catalina. Whew! I *almost* stuck to my list tonight! I saw that Honey Maid Graham crackers were on sale and we are almost out so I had to get them. Other than that little deviation, I think I did pretty good! 4 Crescent Rolls - sale $1.25/ea. 2 Boxes Triscuit, 1 Box Wheat Thins - sale $1.88/ea. 2 Jars Chi-Chi's Salsa - sale $0.99/ea. All You Magazine for only $15.00/year here! Sobe Lifewater $0.25/each at Target! 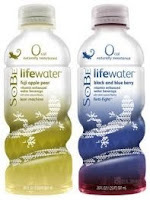 Sobe Lifewater is on sale for $1/each this week at Target. Final Price : $0.50/2 or $0.25/each! FREE Kraft Cheese - TODAY ONLY 1/31! Here is a FANTASTIC Kraft Cheese Meijer Deal that is TODAY ONLY (because it is 1/31!). Pay $5 out of pocket - receive a $5 catalina to use on your next purchase!